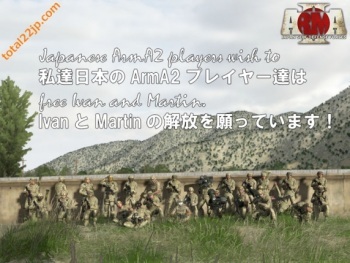 The Arma community has launched a new website allowing gamers to show their support for the Arma 3 developers imprisoned for espionage. Bohemia Interactive developers Martin Pezlar and Ivan Buchta have spent more than a month in a Greek prison facing accusations of espionage arising from their recent trip to the island of Limnos. That's bad enough, but worse is the fact that they could be stuck there for a long while yet before their case moves forward thanks to the general strike currently gripping Greece. There's really nothing of practical value that can be done for them right now, so instead members of the community have launched a "Send Ivan and Martin a postcard" campaign. Just go to the site, select an image or upload your own, fill out your name and a brief message and then click the "send" button. It's not exactly brain surgery, folks. Each submitted postcard will be printed and sent to the imprisoned duo, although limits to the amount of mail that prisoners can receive means that only a certain number of postcards will be sent each week. Once they're free, all the cards, even the ones that have already been sent, will be printed and sent to them in a single, hopefully-huge batch. It's a purely symbolic gesture but there's really nothing else to be done, and at this point just reminding Martin and Ivan that they have supporters behind their cause has to have some value. You can do your part to help keep a couple of guys from going nuts inside a Greek prison at postcard.helpivanmartin.org.